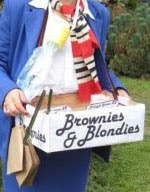 Last weekend I thought it would be a hoot to sell dark and white chocolate brownies at The Green Man Festival dressed up as an air hostess. And why not? Lots of people go in costume. It was a great way to combine selling delicious home-baked cakes, meeting all sorts of different people and wearing something a little crazy! (I even made a fake oxygen mask and a friend designed proper airline logos). At first, people stared a lot. Then they came over gradually and tried the brownies. They loved them! I totally sold out. Lots of people asked for 'under-the-counter' versions...but were turned away. After all, if a brownie tastes this good, why on earth do you need to put naughty substances in it? I made three flavours: plain dark chocolate, dark chocolate with salted almond butter caramel and white chocolate with pecan nuts. The first two versions were based on my friend Charlotte's killer brownie recipe where you replace flour with ground almonds. And the blondies are based on a recipe by Jill Dupleix, but I've added almonds to them to make them more chewy. I am very fussy about brownies: they simply have to be intensely chocolatey, not at all dry and not overwhelmed with the taste of nuts. So here they are...you won't be disappointed. Preheat the oven to 180C. Put the chocolate and butter in a heatproof bowl, set over a pan of cold water and bring the water to the boil (bain marie). Turn the heat down to a low simmer and stir the mixture occasionally with a spoon until the chocolate and butter melt. Put the bowl to one side to let cool for a couple of minutes. Whizz the sugar, eggs, cocoa and bicarb in a food mixer or with an electric whisk, until frothy. Add this to the chocolate mixture, then stir in the ground almonds, the melted chocolate and the coffee. Pour mixture into a large baking tray lined with greaseproof baking parchment and bake for roughly 30 minutes, depending on how deep your baking tray is, how fierce your oven is and how squidgy you want the brownies to be. When you take the tray out of the oven, place it on a wire rack to cool down completely. Do not attempt to cut the brownies up until they have cooled completely - otherwise they might fall apart! Keeps well in a Tupperware container for 4 - 6 days. These are gobsmackingly good - the buttery salted caramel adds a wonderful edge. Simply not for sharing. Makes 18 medium sized. You will be following the brownie recipe above, but first you need to make the salted caramel. You want the mixture to turn a light brown colour - this will take anything between 5 and 9 minutes. Then QUICKLY pour the mixture over the almonds - don't dally because the caramel solidifies instantly. Sprinkle over an extra pinch of sea salt. Leave it to cool down, then shatter into pieces holding a knife with the blade pointing downwards. You might want to do this over a chopping board so you don't dent your surfaces! Now make the same brownie mixture as the recipe above. When the mixture is ready to be tipped into the baking tray, add half the salted caramel almond chunks into the mix, and sprinkle a few on top. When the brownies are cooked and have cooled completely, decorate the brownies with the remaining chunks of salted caramel. Keeps well in a Tupperware container for 4 - 6 days. Never tried a blondie? They are yummy: really fudgey and with a lovely mellow vanilla taste. Pecans are essential - their sweetness really complements the vanilla and white chocolate. Don't worry - these blondies are not too sweet. Line a baking tray with greaseproof baking parchment. Preheat oven to 180C. Chop the chocolate on a board with a sharp knife until you have pieces like large chocolate chips. Roughly chop the pecans. Melt the butter and half the chocolate slowly together over a bain mairie (a heatproof bowl set over simmering water), whisking with a balloon whisk until melted. Put aside to cool down slightly for a few minutes. Whisk the eggs, sugar and vanilla extract. When the chocolate/butter mixture has cooled down a bit, add the egg and sugar mixture to it and whisk together. Sift in the flour, bicarbonate of soda and salt, add the ground almonds and stir, then add the remaining chopped chocolate and pecan nuts. Pour the mixture into the prepared baking tray, smooth down the top with a spatula and bake for about 22 minutes or until the top is set and a nice golden brown colour. Allow to cool in the tray and then cut into squares. Keeps well in a Tupperware container for 4 days. Ok, after reading this, Jess has made me buy 1.5 kilos of choc on the way home. I am going to get so fat. Damn youuu. A small price to pay for chocolate Nirvana, Kev!